As a New York City local, I've enjoyed observing the growing wave of independent fragrance lines based in the borough of Brooklyn. CB I Hate Perfume may have been one of the earlier and better-known names to set up shop, but now there are enough options to suit various tastes. One relative newcomer is Ellis Brooklyn, founded by Bee Shapiro, a former corporate lawyer and current beauty writer for The New York Times. I recently received a sample of Ellis Brooklyn's Rrose in a Sephora order and gave it a try. Rrose is a rose-centered "olfactive ode to Rrose Sélavy (a pun of Eros, C’est la Vie), the feminine alter ego of the author, artist and provocateur Marcel Duchamp." It was developed for Ellis Brooklyn by perfumer Jérôme Epinette, and its composition includes top notes of lemon, cassis and pear; middle notes of lotus blossom, peony and centifolia rose; and base notes of cashmere woods, spring musks and vanilla orchid. Yes, you're remembering correctly: another fragrance dedicated to Duchamp's stylish and mysterious feminine persona was released in 2016. That was Maria Candida Gentile Rrose Sélavy, which Kevin reviewed back in May. As someone who has spent a lot of time around art by Duchamp and his contemporaries, I completely agreed with Kevin's assessment: it's a smart and surprising composition that could be worn by men as well as women. What about Ellis Brooklyn Rrose? This fruity floral is a very different fragrance: it's a fresh and dewy rose-peony bouquet with hints of citrus in the intro and sheer synthetic woods in the dry down. Rrose has moderate sillage and above-average staying power on my skin. The main problem? I can't find any olfactory-conceptual link between this fragrance and the original Rrose Sélavy. Duchamp fans won't find this scent odd or compelling enough to hold their interest, and women looking for a pretty rose-peony perfume may be put off by the idea of some old French artist in drag. Basically, Rrose by any other name would make more sense to me. Ellis Brooklyn Rrose is available as 50 ml Eau de Parfum ($100) via Sephora, Beautyhabit, and the Ellis Brooklyn website. * The website does specify that Rrose does not contain parabens or phthalates and that the cap is "biodegradable and contains no petrochemicals". Note: top image is Photograph of Marcel Duchamp as Rrose Sélavy on “Belle Haleine: Eau de Voilette (Beautiful Breath: Veil Water)” (by Man Ray) via Wikimedia Commons. I got a tester of this as well and was also confounded by the disconnect. I was expecting something unusual or at least some kind of “new” take on rose, but it smells like typical Sephora/Dept Store fare to me. As a scientist, I agree. Although I do craft my own body oils and scents at home using (very expensive!) natural essential oils, a lot of my stuff could cause photodermatitis or clogged pores. Mineral oil remains one of the best oils to use on human skin, and many lab created fragrant essences are actually better tolerated by a majority of people. So true…not everything botanically derived is safe, and many people *can’t* tolerate essential oils, etc. It’s pretty, but it’s definitely a disconnect. I love art/style/perfume connections, when they work…but this one didn’t hold up for me. Ah, the “natural = safe” battle. Do I like to use natural products? Sure, but, as I’ve told many a person, arsenic, lead, and mercury are all natural, too, but you want to be careful in using them. That is an odd disconnect between inspiration and product. If you didn’t know that Duchamp was the inspiration, Jessica, who would you have thought was? Hm…someone who painted/drew roses or who tended a famous rose garden…but *not* Josephine…let me think about this! 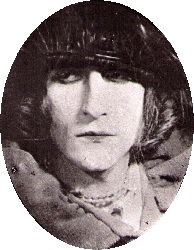 …It would fit the artist Maria Oakey Dewing very well, but she’s nowhere near as famous as Duchamp! Ah, pretty flowers. Is there a rose perfume like Fantin-Latour? I don’t really go for roses but I would try that. MDCI Rose de Siwa would be Fantin-Latour-worthy, I think!! When my health students try to argue that marijuana is “safe” because it’s “natural,” I like to suggest they go lick some psychodelic toads for a safe high, too. I agree…The One Rose and Rosa Excelsa were both dull and thin and overpriced. And very much alike, iirc. This reminds me of Penhaligon’s Tralala, where clearly no one involved had bothered to inform themselves about who the character was and her horrible fate. You’d think people would know by now to do a quick google search and at least read the Wikipedia entry. Looking deeper into the company website, they’ve also done candles named for famous authors…but Paddywax beat them to that concept (even the same writers) a few years ago. I have a sample of this, but I would much rather try the MCG Rrose Selavy. Kevin’s review sounded much more enticing. It’s a nice springtime rose…but it does not evoke Duchamp and/or Rrose Selavy for me, at all. Maybe I’ve just spent too much time thinking about Duchamp over the years…nope, that’s impossible. Just one question:WHY?? ?.Is there a new trend for “Dead-supposedly-celeb-scent”?Because I guess he was a “celebrity” in his lifetime?Famous/Infamous?This doesn’t sit right with me at all.Crankiness added. I don’t know…because dead famous people are up for grabs and can’t sue? Yes, he was (in)famous in his time, but if you’re going to do an olfactory homage to a writer/artist etc., at least try to make it true to his/her character. Thanks for your review Jessica. Haven’t seen or heard about this one but I’m already put off enough to not want to try it. Reading this on the heels of a Canadian Huff Post article “Is Fragrance the New Second Hand Smoke?” which also labels fragrance as toxic and as polluting our environment. I have a small bottle of MCG Rrose Selavy and think it matches its namesake-beautiful, but also with some challenging/ugly aspects, and I think it turned out to be somewhat polarizing. If I happen upon this I’ll give it a sniff. Yes, the “challenging/ugly” part is CRUCIAL if anyone is going to do something inspired by a Dada artist. Grumble! I haven’t seen that article and I’m going to try to resist looking it up, because it will just make me even crankier. I have to join Jessica in resisting looking up that article. On the one hand it is fair complaint that if you don’t like the way someone next to you smells, whether the scent is cigarettes, body odor, or Bois de Isles … It can feel like your space is being invaded. But do the latter two cause lung cancer? Oh damn. Now I have that heart-sinking feeling some scientists are saying that there are carcinogens in perfume that can be spread through the air like like cigarette smoke. I won’t read the article. I won’t read the article. Am I a perfume denier? HI there, I’m the founder of Ellis Brooklyn and just wanted to comment on some of the feedback. We actually are not 100% natural and agree with many of the commenters here that natural does not necessarily mean safety. We opt for synthetics when they are the safer option or when they are the more sustainable option (we’re not going to use endangered woods if we don’t have to). As far as “non-toxic” goes, we don’t use parabens or phthalates (which is used quite a bit in perfumery). We also don’t use any absolutes which are rendered via hexane. Lastly, we comply with IFRA standards for fragrance safety. On the topic of Rrose Selavy. I had originally explored an androgynous rose to go with the Duchamp idea, but I thought that would be rather expected. Duchamp being the master of the unexpected, I took a different route. If you look at early pictures of Rrose Selavy, they were almost seedy and she looked like a transvestite. In later pictures, particularly the ones Duchamp did with Manray, they become more and more like glamour shots with blurred imagery. The way I saw it was that through the “life” of Rrose Selavy, she became more and more feminine—more and more convinced of her youthful charms. And in some ways, more and more stereotypically female. So instead of going the androgynous or unisex rose route, I thought to reflect these later years. I imagined if Rrose was a real life woman how she wouldn’t choose an androgynous scent, she would choose something overtly, obviously feminine and young and pretty.